Boating Writers International awards competition. 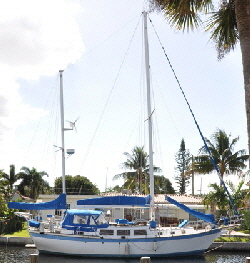 She was born in 1977 and grew up as a ketch. It was only after she met me that her life and her name changed—a bit like the wife I suppose. People have asked why I decided to change a perfectly good ketch into a staysail schooner? This is a reasonable question, and the answer is “Because I really wanted a brigantine, and I don’t like the sound of a hermaphrodite ketch”. A brigantine is a two masted sailing vessel, traditionally a schooner, with the foremast square rigged, and all other sails fore and aft. The name conjures up visions of Brigands pirating their trade along the Mediterranean Barbary Coast—which is what I might have to resort to after spending all my money on this boat! 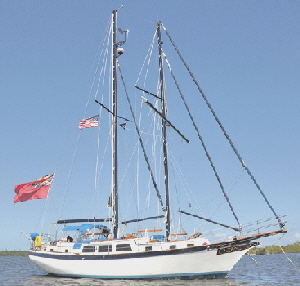 To me, a brigantine is the ideal small boat cruising rig—the best of all worlds—capable of hauling tolerably close to the wind with its fore and aft sails; (although not as high as with an 85hp Perkins diesel); having fast reaching capabilities and unbelievable down wind stability using the squaresail(s). Also, like a ketch, the sails are divided into smaller, manageable sizes. Squaresails have been used on boats for centuries, and when the wind is astern, or a few points either side, it is still a very efficient way to propel a boat of any size, even today. Anyone with Bermudan sails knows how tricky it can be to hold a steady course when running before the wind, especially when a big sea is rolling up astern. Even with poles and preventers the helmsman still needs to keep a keen eye on the wind and his course to prevent the sails collapsing, then re-filling with a resounding crack! imposing great strain on the sail. With squaresails correctly braced there is absolutely none of this, the boat becomes very stable and the course can even fluctuate widely. There is no concern about gybing or broaching, and the helmsman or autopilot will have little difficulty in keeping a steady downwind run. The boat will also roll less. However, there is a significant and normally insurmountable problem with having a whopping great flat sheet of canvas billowing out from a yard high up a mast. That is, furling and unfurling—not to mention reefing—the darn thing! This single issue precluded the use of squaresails on all but vessels with large crews, like sail training ships, with lots of young people prepared to scale the ratlines and edge out along a flimsy footrope, to secure or release the canvas from the yard. Even if they are harnessed to the yard it is still a very very dangerous operation. But what if you could easily furl, unfurl and reef a squaresail from the safety of the deck, or even the cockpit, without a single person having to go aloft? Now that would bring a completely different perspective to their use on a short handed sailboat! I spent two years designing and building such a system, with a squaresail, called the fore-course, which rolls up inside the yard. It’s a system not unlike a roller furling mainsail, but mounted horizontally with control lines coming back to the cockpit, where the sail can be progressively reefed by one person. The ramifications and how this was designed and constructed is outside the scope of this article. In fact it is a long article in itself, full of twists and turns, (forgive the pun), and a lot of swearing. 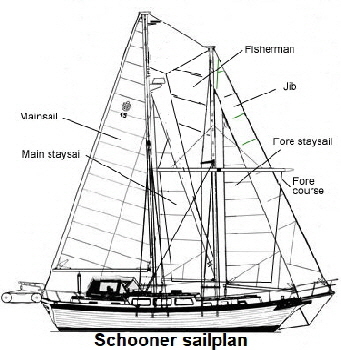 This is a rather long-winded explanation of why I wanted a staysail Schooner. I consulted two naval architects and an internationally renowned rigging expert. None could advise me, (or possibly more accurately, they didn’t want to get involved), how to change a ketch to a staysail schooner—never mind a brigantine. “Why don’t you just buy a ready made schooner?” people asked. I certainly would have, if I could have found one within my budget. Changing the rig meant moving the positions of the existing main and mizzen masts—in fact, swapping them over, so the mizzen went forward and the main aft. Then, just to complicate things, the forward mast becomes the fore, but the rear is still called the main. It also meant repositioning all the chain-plates to the new rigging positions. Luckily, these were simply bolted through the hull with stainless 1/2” bolts. All these were done before the masts were to be lifted. 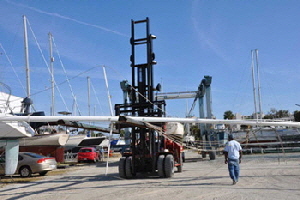 We had moved the boat to the lifting dock and previously removed the booms, loosened all the rigging screws from both masts and removed all other fixings. It had taken four days, but now we were ready for the big heave. The massive mobile crane arrived promptly at 1.30pm. A heavy hawser noose was slipped round the mainmast from the crane, and the tension taken up. The crane operator indicated the load from his cab—one finger for each 1000lbs of lift. He said it normally took between 1000 and 2000lbs to break an old embedded mast out of its step. However, we sailed right past 2000 to 3000lbs and the only thing that happened was the boat lifted about 10” inches out of the water! I went below and whacked the mast with a hammer, hoping to break it free on its step. My helpers waggled the mast as best they could from on deck—still nothing. The crane operator said it was my call, if I wanted to go to a greater load, because his crane was capable of lifting the whole 22 ton boat out of the water if necessary! I decided to try one more 1000lb heave, but at two tons of lift there was still absolutely no movement in the mast, except the boat lifted even higher. I had visions of pulling the mast and half the keel out of the bottom of the boat, so I chickened out and stopped the lifting. After some deliberation I decided that drastic results require drastic measures. A crowd had gathered by this time, (don’t they always), and were astonished when I appeared on deck with the hefty electric reciprocating saw fitted with a 10’ inch metal cutting blade, and started to merrily chop the mast in half at deck level. It must have looked very strange, but what the onlookers didn’t know was that I intended to have the mast finish at deck level anyway, then splice it to a compression post down to the keel. The crane held the weight and as the last cut went through the mast it lifted a mere 3” inches. The rest was outside my control. The yard crew lowered the swaying stick on the fork truck arms and off it went to be laid down on already prepared trestles. Next, the mizzen was easily lifted off it’s deck-stepped location, and laid next to the main. The whole operation only took two hours, but it seemed longer to me, and I was very relieved when it was over. I then had to think of a way to pull the remaining mast section out of the boat. It was suggested I pour half a gallon of mercuric acid down the pipe, in the hope it would dissolve the corrosion which was the only thing gluing the mast to the keel. For a while the boat looked like it had a steam engine, with fumes coming out of the mast smoke stack, sticking out of the deck. After a few hours I set up two heavy wooden sleeper blocks each side of the mast, then placed my heavy trolley jack across the gap. I drilled holes at either end of the mast stub and shackled a strong chain from one hole to the other and over the lifting end of the jack. It was then just a question of pumping the jack until something happened. It is a 2000lbs jack and it took all of that to break the joint at the mast step, which finally separated with a indifferent ‘pop’ and the corrosion brute was beaten. The reason the jack was able to break the joint was because it was actually pulling the mast up between the rigid deck and the immovable keel, whereas the crane was relying on the weight of the boat to separate the joint, and that was floating. I worked on both masts and their booms for six months. First stripping them of all attachments, winches, rigging, wiring, radar, wind generator, spreaders, lamps, etc. All the old paint was then stripped off - no small job for a 57’ foot mast. Brackets were then welded on to take the new rigging and stays. The mainmast would now came through the saloon, but I didn’t want a 10” inch by 7” inch mast obstruction right in the middle of the cabin, so I spliced a 4” inch square compression post to the mast, using splicing pieces supplied by the mast maker. This extended the mast by 11’ feet to the bottom of the boat where it sits on a heavy wide spreader plate directly on the bilge floor. The schooner foremast stepped forward of the ketch mainmast so it needed a substantial new mast step, which I made by pouring industrial cement into a wooden mould directly on to the keelson. I also wanted to extend the foremast height by 8’ feet, to produce a wider ‘slot’ between the jib and fore staysail. 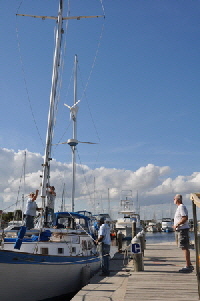 The taller foremast also increased the jib luff by some 8’ feet which improves her upwind performance. I also needed a taller foremast to be able to carry a second square tops’l above the course, if ever I got round to it in the future. The foremast was extended with a length of the same section, and internal splices. All the spars were then repainted, firstly with aluminum primer undercoat, then two coats of undercoat, then about seven layers—we actually forgot how many—of Navy Blue two part polyurethane from Interlux. The original spreaders were, made of spruce and very worn and cracked. I bought new, longer aluminium spreaders for both masts. The forward ones on the foremast were also raked aft 30 degrees, to allow for bracing the yards. I then fitted the French made Facnor roller furling system to the back of the mainmast, which effectively converted it into a roller furling mainsail. Originally only the jib was roller furled, but I wanted to control all sails from the safety of the cockpit, so I also converted both the fore staysail and the ‘tweenmast staysail to roller furling. That made all five sails roller furling, including the squaresail, with furling lines all coming back to the cockpit. I also riveted aluminum mast climbing steps all the way up both masts at 20” inch centres, with a double step near the top. These do increase windage, but they are so convenient for single handed mast work. I never thought it would be over a year before we slid the masts back into their new locations. Actually, the work didn’t take that long, because in the middle of Florida’s summer we decided to leave them in the yard when it was simply too hot to work outside. Having air conditioning inside the boat made it more sensible to work inside, and we weren’t going anywhere anyway—we had no masts. Re-stepping both masts was basically the reverse of lifting them and went relatively smoothly, with much less stress. Britannia is registered as a British vessel, so I placed the traditional antique British penny under both masts, before they were lowered on to their mast step. One thing which concerned me was whether the boat’s balance would change by switching the mast positions, but nothing was perceptible at the waterline after both masts were in place. 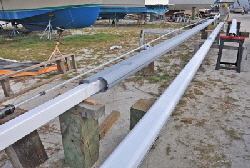 There are advantages in having a heavy long keel cruising boat with a 14’ foot beam. You can add more or less any weight without ill effect. Initially the masts were stayed with rope lines in place of the steel rigging which had yet to be measured and ordered. I then had to go up both masts and measure from each wire attachment point down to their turnbuckles. The original wires were 5/16” inch and 1/4” inch, but I ordered new wires using 3/8” inch stainless throughout. 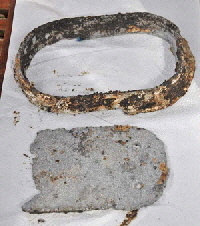 I had also installed twin main backstay chainplates, instead of the single one for the original mizzen. I believe in a belt-and-braces approach for an ocean cruising boat. While waiting for the standing rigging to be delivered I had all the rigging screws and turnbuckles chrome plated along with all the winches and cleats. These were now bolted to the masts. 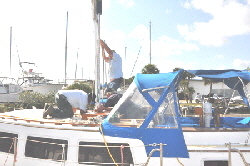 Within a few weeks the new wires arrived and I was hoisted up the mast a dozen or so times, bolting them in place. Thank goodness for the brand new Maxwell electric windlass, which made the job effortless for the deck crew. Eventually, with both masts securely stayed, the day came to hoist the yard, which had been sitting in my garage for over a year. I transported it 85 miles to the boat on a special wooden extension framework I fitted on the roof rack of my van. It measures 25’ feet and stuck out 6’ feet in front and 3’ feet in the back of my van. With help I finally maneuvered the long yard into position across the boat and set up the various control lines. Then up she went, on the track I had riveted to the front of the mast. 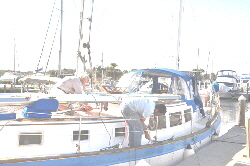 The combined yard and sail weighed 135lbs, but it was easy with the help of the windlass. There are nine control lines for the yard and course: a hoist at the gooseneck; a lift each side; braces each side; two lines for the sail furling mechanism, and two sheets from the clews of the sail. All these lines had to have running blocks attached to their respective mast lugs, lines rove and cleats attached to the masts to secure them. To separate and identify all the lines coming down the masts I made four teak pinrails and turned sixteen belaying pins on a lathe. These make for a very clean deck with no loose lines lying around. They also add an air of traditionalism to an otherwise modern boat. .
We have yet to manage to take the ultimate photograph of Britannia under full sail, but she certainly looks the part, sitting quietly at anchor.